Germany had an awesome death metal scene in the early '90s, it was quite experimenting and shoved larger diversity than the other scenes. 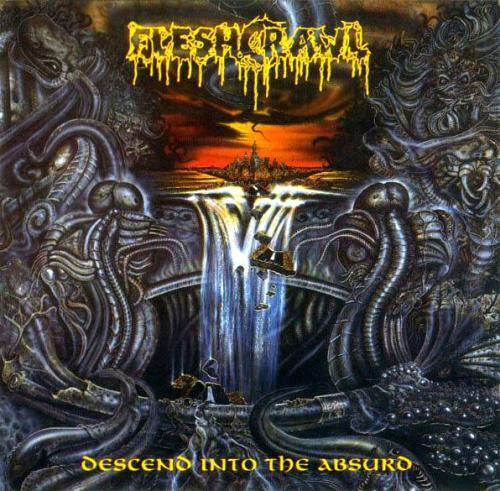 "Descend into the Absurd" by Fleshcrawl counts as one of the important classics of the scene. In influences their music is colorful, but the most obvious sign may be the reference to Autopsy in the band's name. Even if they had more unfortunate name changes, it's evident that this name selection wasn't accidental, because unlike most bands that time, they added slow downs and extended themes into their music. Similar to Autopsy these slow parts included weird melodies which created a geniune atmosphere, a feeling that strongly increased the level of sick feeling of their music. 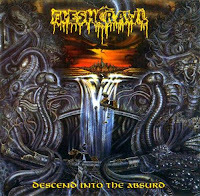 There is no lack from more intense and hammering parts either on "Descend into the Absurd", it just sounds like that the band tried to find some sick balance. And even though their themes are not complex in general, it's not an easy listening material, and this is exactly it's strongest pont, because it's possible to discover something new at every listening. A stunning old school classic!